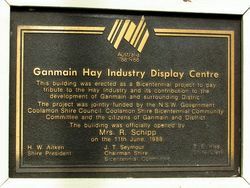 The Ganmain Hay Industry Display Centre was a Bicentennial project to pay tribute to the hay industry and its contribution to the development of Ganmain and the surrounding district. James Logan was one of the early pioneers of the district coming by wagon in 1886. The first block of land he selected was 160 acres and he went on to own about 1000 acres. Logan operated two travelling chaff cutters and had a modern, for those times, cookhouse constructed for his employees. He was known as the ‘Chaff King’. In the 1920’s a competition was run between the farmers of Ganmain to see who could bring in the biggest load. Through the eff orts of some energetic and enterprising farmers, the district gained the reputation of producing the fi nest quality cereal hay. 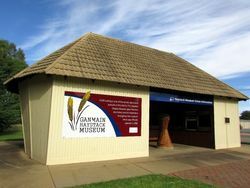 In the early days of settlement, many of the farmers went in for growing hay more than for growing wheat for grain. The years 1910 to 1925 were the peak of the chaff cutting industry in the Ganmain district. During that period 23 private and contracting chaff cutters operated in the Ganmain area employing over 200 men and many families. With good rainfall at the right time, today the Ganmain district produces up to 20000 tonnes of hay for the chaff industry. The hay is still cut with a reaper and binder which then ties the sheaves automatically. These are dropped off in rows which are stoked manually and after curing, carted into stacks or to the chaff cutters. 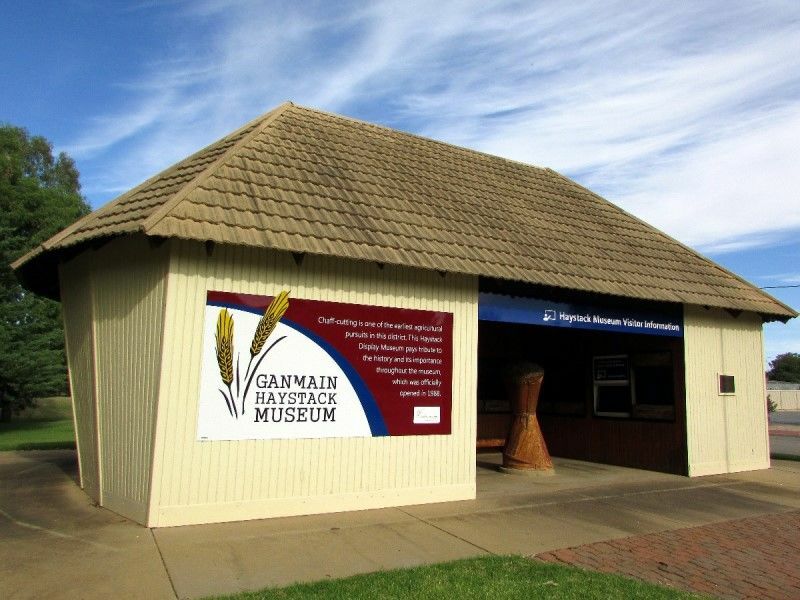 Two chaff cutters are in operation and Ganmain is still the centre of the sheaf hay and chaff industry of the Commonwealth. development of Ganmain and surrounding District. Committee and the citizens of Ganmain and District.